Try to imagine spending twenty-four hours inside a 30-inch cube. Once free, you are completely stiff. Your joints ache. Your muscles go into spasm when you walk. Your fingers hurt to straighten and have no strength. You can’t think clearly and all you want to do is rest. Now imagine it happening for no reason other than increased stress, or a few hours of lost sleep, or time spent directly near air conditioning. For the past few days, I’ve been sidelined by this invisible condition that few people understand. While not fatal, it cuts productivity, destroy careers, strains relationships and drains self-esteem. These vague, “here today, gone tomorrow” pains have been a part of my life since early puberty. Before then, I was like any other child, able to run and climb and hang upside-down on our jungle gym. But at eleven or so, muscles in my legs started to spasm. Then, my mother labelled it “growing pains” and massaged rubbing alcohol into my hamstrings and calves to stop the cramping. In a family of seven children, I was the only one who seemed to have pain issues, and though no one said it aloud, I believed the perception was that I was a crybaby or hypochondriac, or simply desperate for attention. It was the beginning of the “stigma” I would feel for the rest of my life as various parts off my body mysteriously turned against me. Everyone wants to feel strong and capable and vibrant, and I am no different. But over the years, nearly every new activity or increase in physical work backfired on me, causing bouts of pain that lasted months longer than the activity. I’ve been in therapy for knee, jaw, shoulder and neck issues more than I can count. They’ve exrayed, scanned or “MRI’ed” every part of me. I’ve seen chiropractors and rheumatoid specialists, and had traction and acupuncture. During two years of right shoulder problems, the muscles atrophied and the joint “collapsed. ” I’ve been told my muscles are “twitchy,” meaning that they overreact to stimuli. And I’ve been through the gamut of medications, from muscle relaxants to cortisone injections, Oxycontin to Demerol to Darvon, morphine to anti-seizure drugs, sleep aids to antidepressants. 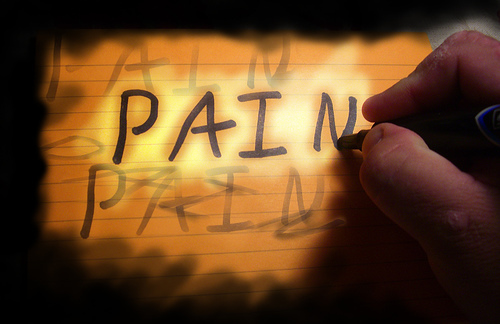 Then finally, less than ten years ago, came the diagnosis – fibromyalgia. I realize now that my absences from work, all of those times when my body ached everywhere, like the start of a bad flu, were, in fact, fibro flares. And the entire time, I felt embarrassed and defensive because I was always sick, or aching, or exhausted, when to the rest of the world I seemed perfectly healthy. Throughout all of this, I’ve learned that the best thing I can do is pace myself. Like someone with digestive problems, I have to avoid too much of anything, so I exercise, but can’t push too hard. I sit, but never for too long. I stay mentally engaged and active, but try to guard against too much stress. Move outside of moderation, and I risk a sudden episode of pain or brain fog. And though I miss earning a good wage, I’m hesitant to commit to anything that would prove too demanding. I don’t feel sorry for myself, because I am alive. Many dear friends have died too young, and they would gladly trade their illnesses for mine.